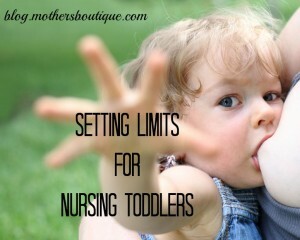 What I have done is set limits to our nursing. Because I know parenting a 3-year-old is trying at best, and nursing a 3-year-old is emotional, I wanted to share what we’ve done in case it sparks some ideas for you nursing your very own caveman toddler. I nightweaned. There was just no way I was going to be providing overnight milkies to two children. I should really say my partner nightweaned, because he’s the one who provided the cuddles and the sippy cups of water during night wakings. We bought the book Nursies When the Sun Shines, which didn’t totally help, but is still a favorite in our reading rotation. I stopped nursing in public. By the time my son was 2, I felt uncomfortable nursing him in public and simply told him we only nurse at our house. When he asks in public, I remind him of this and offer him a choice to stay and play or go home to nurse. Sometimes he chooses nurse, and I try to make that seem like an okay choice (even if I’m frustrated by it). I gradually cut down the number of sessions per day. Right now, we’re at 1 per day. He can pick when it is, and he knows he only gets 1. It was 2 for a long time, and even now, if he’s sick I let him get a bonus session. Because antibodies! We work his latch like crazy. Toddler latch is such a terrible, painful thing. Especially when my breasts are gushing newborn milk, my son just doesn’t have or want to work hard for the milkies, and it’s painful. We frequently stop to have him open his mouth wider, adjust his tongue, etc. When you’re nursing a child who can talk, well, you can talk about these things together. Are you nursing a 3 year old? Leave us a comment to share your best tips for making it work.